 *14 March as Pi Day is superficial fluff that teaches us nothing about π. Tau Day is also silly, especially since τ unnecessarily complicates the calculation of the area of a circle. This entry was posted in Items of Interest and tagged geometry, holidays, Math, Pi Day. Bookmark the permalink.